Forward Chloe McKenzie ’14 netted ten goals in a breakout sophomore season and will again be a centerpiece to the Jeffs’ offensive success. Will the 2012 Lord Jeffs build upon their 2011 performance and cement themselves as one of the top teams in the NESCAC or will they revert to their 2010 form? This season will go a long way in determining the direction of the program. While a lot of things will be different about the 2012 team, thankfully the woman patrolling the sideline remains the same. Coach Jen Hughes enters her ninth season as coach of the Lord Jeffs and has posted an impressive 92-28-19 record during her time at the helm. Last season, Hughes garnered NESCAC and NSCAA New England Coach of the Year honors.The biggest change between the Amherst team of the past two years stems from the changing roster. Amherst watched six key seniors graduate, almost all of whom started or played heavy minutes for the Jeffs. “The main difference lies in the fact that we graduated a large group of seniors last year, who, as a group, were inspirational leaders,” captain Kate Sisk ’14 said. But with their depth, large team size, and talent pool, the Jeffs seem well equipped to fill the voids left both on and off the field. “We have a new senior class who is already stepping up to lead this team and drive this season,” Sisk said. One player who will be counted on heavily for both is co-captain Kathryn Nathan ’13. Named NESCAC Co-Player of the year last year, Nathan’s ability to control a game from the midfield was equally important as her nine goals and nine assists. Also earning All-American nods last season, Nathan must continue to control the field if the Jeffs want to make another NCAA run. Only Sarah Duffy ’14 posted more points than Nathan last year with 14 goals and ten assists, and she too will be crucial to the team’s offense. 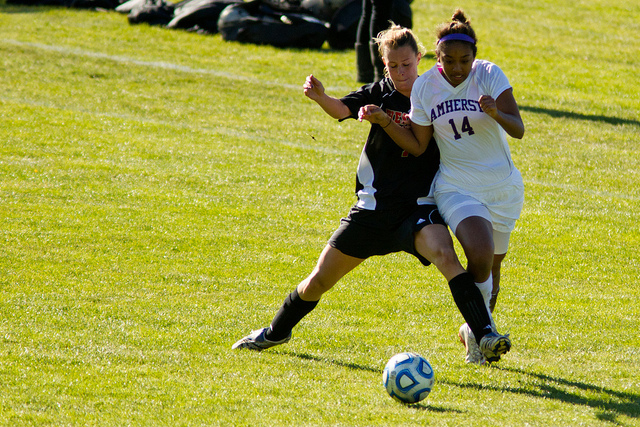 While the two hope to connect frequently with each other and forward Chloe McKenzie ’14 (ten goals last year), they also are the first to acknowledge that soccer is a team challenge that requires organization from back to front to win games. Nathan seems confident that they have replaced their senior losses. “We will find strength in the depth of our team,” she said. Amherst welcomes a strong recruiting class to help cope with the losses of its graduating class, all of whom are eager to make an impact from day one. The strength of this year’s team appears to be its offensive prowess. The Jeffs like to score goals early and often. When they will be most susceptible is on the other side of the ball. “We return almost all of our scoring from last year, so hopefully our offense will be strong again,” Hughes said. It is clear there will be a lot of changes between the two teams, but that doesn’t mean the 2012 team won’t channel the 2011 team in some aspects. “Our biggest strength this year is our confidence. Having traveled deep into the NCAA tournament last year, we know we can compete with the top teams,” Sisk said. A lot of their success came from their one game at a time mentality. Hughes will not allow players to look ahead in the schedule, but instead only focus on the game at hand. They will focus on each game as it comes and hopefully, at the end of the year, the games will add up to an improvement on their 2011 season. With a consistantly strong conference and perennial threats Williams and Middlebury gunning for them, it will be hard to top, but the 2012 Jeffs seem poised to try. The Jeffs open their season on Sept. 12 against Mt Holyoke.